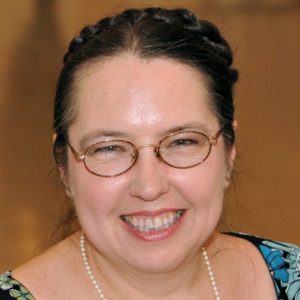 There is a rumor that Spring may finally be creeping around the corner… The weather is warmer, and I did see a few flowers and buds on my walk yesterday – though fewer than normal, for this time of year. Meanwhile, we’re still eating a lot of root vegetables… so I was looking for Something Else to do with carrots. I mean, carrots are really delicious – they’re sweet, and crisp, and the bright color helps the look of a plate – and I do have several way to cook them already, but… a little variety still helps. 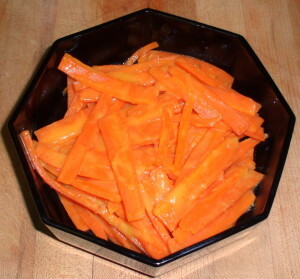 Ginger is a classic combination with carrots. 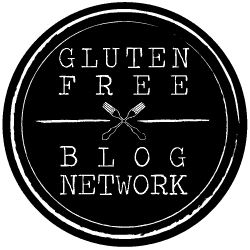 I was at the little greengrocer/convenience store across the street – we have many of them in New York, and the vegetables available in mine are much better than the ones in the local grocery store. 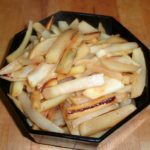 (There are stores with very good produce departments – just not the one down the block from me…) I needed some onions – and I noticed the root ginger. I haven’t used that for a while… and it is a wonderful combination with carrots (I still had a couple, from my last Greenmarket foray.) Good, I thought, that will add some sparkle. Then, at home, I noticed the orange juice – another good combination with both carrots and ginger. I decided to cook the carrots in the OJ and ginger. First, I cut the carrots in matchsticks. Yes, if you have a mandoline with a julienne setting, go ahead and use it. I don’t, so I just sliced them. (Which really doesn’t take long for two carrots… though it might be a drag to cut enough for a large family.) 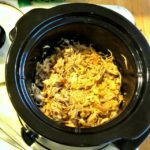 You can cut them any way you like, of course – I thought this would work well for the tender crisp texture, and provide plenty of surface for the seasoning. 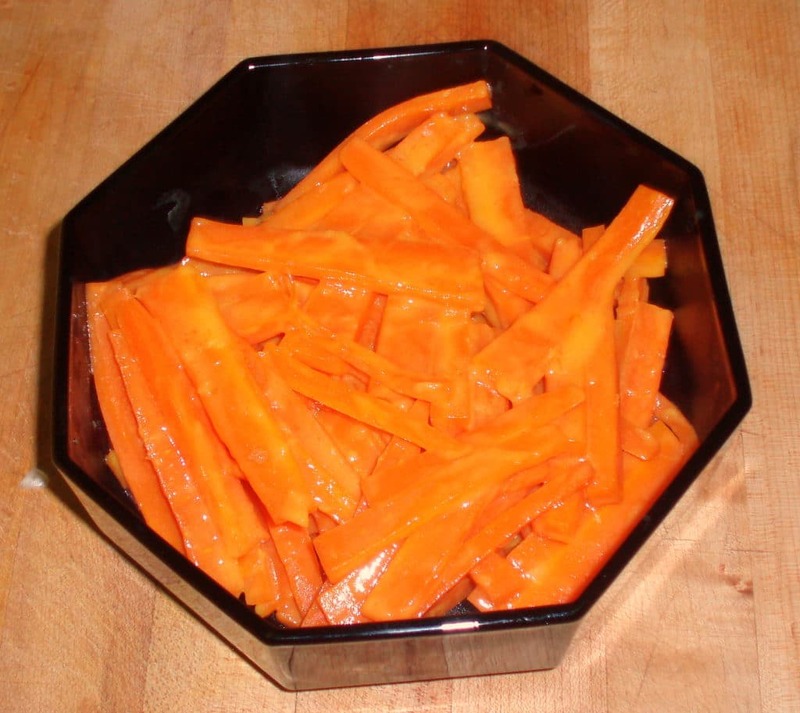 Then I put the cut carrots in a shallow pan – I used a small frying pan – with about half a cup of orange juice. 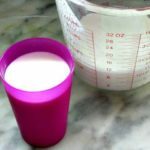 I’d actually planned to use less, but it was the end of the container, and I didn’t want to put it back with just a couple of ounces – and I think this worked very well. 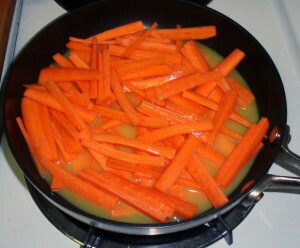 I wanted to reduce the juice, as well as cook the carrots, so I put the pan over high heat, and let the juice boil. 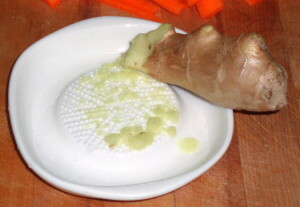 While it boiled, I grated the ginger. I recently acquired a proper Japanese ginger grater, so used it for the first time. 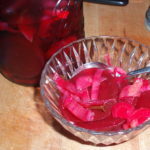 It has the moat around the grater to catch the juice – indeed, in some Japanese dishes you use only the juice, squeezing the pulp dry and then discarding it. I’ve used the fine side of an ordinary grater, before, but I realize it did lose some of the juice. Use whatever you have. I used a sharp paring knife to peel the end of the ginger root, and then grated the exposed part, and set it aside. Meanwhile, the juice was cooking down nicely, and thickening slightly, which caused it to coat the carrots. I added the ginger juice and pulp (I hadn’t wanted it to boil long,) reduced the heat slightly, and started stirring. 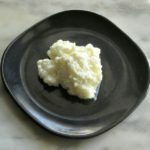 Once the juice was really reduced, I also added a bit of butter for richness and to smooth it out into a sauce. Once it glazed the carrots, I served them. They were wonderful, if I do say so myself. The carrots were the tender crisp texture I’d wanted (I’d been afraid of over cooking them, boiling down that much juice.) The orange juice added sweetness as well as flavor, the ginger balanced that with a delicate bite. (Rich’s one suggestion was More Ginger – I’ll do that, next time.) 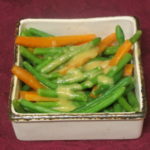 It gave me glazed carrots without any added sugar – and with much more interest than some I’ve had. I’m definitely going to use this for guests, and for holidays, as well as just to give us variety. Scrub carrots, peel if needed. Cut into matchsticks. 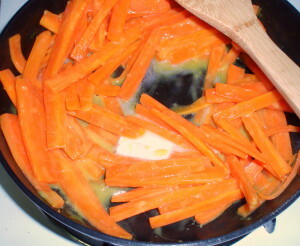 Place carrots and orange juice in a shallow pan. 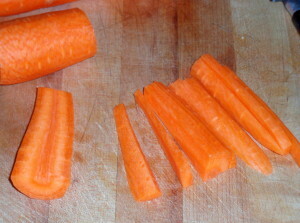 Bring to a boil, and let continue to boil, to both cook the carrots and reduce the liquid. When the juice has boiled down by half, add ginger. Start to stir every minute or two. When the juice is boiled almost away, leaving just a little liquid in the pan and glazing the carrots, add butter, stir, and serve. 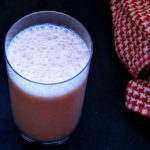 Ginger with carrots is a perfect match and a wonderful way to add a gentle heat to pair with the sweetness. And I hope you're right - I'm ready for spring to get here! Thank you! Honey carrots was always a bit too sweet for me, in the middle of a meal - but I liked the idea of a touch of sweetness, to balance the ginger, and thought the juice would provide that. I think it worked well... I hope you enjoy it.